How can we make our current solar panel technology more efficient? Chris Smith spoke to Doug Chrisey from Tulane University in New Orleans who is developing something called Magnetohydrodynamic Solar Panels. Sounds like a bit of a mouthful, but let's find out how it works. Doug - A magnetohydrodynamic generator is quite a bit different from a photovoltaic. In a photovoltaic, you're taking a narrow slice of the spectrum of solar radiation and converting that directly into electrical power in a solid state, and you usually get about 20% efficiency. With magnetohydrodynamic power generation, we want to take that solar radiation and concentrate it to a high temperature and create a plasma. A plasma that will be send through a magnetic field and the magnetic field will separate the positive and negative charges, and we can get about 60% efficiency. Chris - Wow! That's quite impressive. So, can we just look at how this works then? You've mentioned there are photovoltaic cells and you said when photons of light hit those, they'd cause charges to separate. You're doing it slightly differently. You're heating something to make a plasma where you have charged particles. So first of all, what are you heating to make the plasma? Doug - We're heating a channel that contains the gas that has material-like caesium that's easy to ionise and then we take that hot gas and send it through an expansion nozzle through a magnetic field and at that point, we can take and produce the plasma, and separate the positive from the negative charges. Chris - So, as the gas is going through that nozzle, and you've got this positive and negative charges because plus and minus charges are sensitive to a magnetic field. They can be guided in one direction or the other. Meaning, you can presumably push them onto a conductor which becomes negative and another conductor effectively becomes positive and then you've got an accumulation of charge with the potential difference. Chris - So, how does this actually then get deployed? How do you get the light into that channel and how much energy can you make this way? Doug - Well, the amount of energy you can make is just dependent on how much radiation you take and focus on this channel. So, the direct answer to your question is it's very scalable. It can be a small size or it can be large. We envision something as small as what would fit inside perhaps a container, like on a container ship. So, that's so relatively large. But still, that's still easily deployed to different locations like natural disasters or war zones, or developing countries. So, it's a nice way to have power right away. By the way, once the sun goes down and photovoltaic stop working, we can take and heat this channel and we won't have as much efficiency, but we'll still generate power. But it is the 60% efficiency that makes this technology very exciting. Chris - How easy is it to actually construct an array of these so that you could then produce a big array to provide power for an environment, or a factory or something like that? Doug - Well, as a scientist working in a lab, just engineering between the lab and actual applications. So, I'd like to say it's easy, but this technology has been around for some time and what we're doing is just a little bit different. We're trying to improve this efficiency, actually reach the maximal efficiency by using superconducting magnets, high temperature superconductors that have trapped magnetic field in them, and as such, reaching very, very high overall magnetic fields on the order of 17 tesla. So, in doing that, we want to put those magnets very close to this very, very hot plasma, essentially, liquid nitrogen temperatures right next to something that's ½ as hot as the sun. Chris - That's quite an engineering challenge, isn't it? So, how are you doing that and stopping the very, very hot thing, making very, very cold thing become very, very hot? Doug - First of all, the materials we use have to be special and it is very difficult. It's a real stacking of functionalities here, in terms of needing refractory materials like ceramics as insulators, but also, electrodes made from something like platinum, something that would survive these high temperatures. But to get something very cold next to something very hot, we need to have a lot of special thermal isolation and to do that, we're using some technologies that are currently being used for electronics such as microchannel cooling. If you make the channels of the material extremely small, they have a very high surface and then can take and absorb any of that heat, and take it away so you don't warm up your magnets. Warming up the magnets was something that was found with this approach from long ago. If you warm up a conventional magnet, it will destroy the magnetic field as well. Chris - If you've got caesium at very high temperature, is that not risky? Doug - It's a dangerous material, that's correct, so I'm not going to discount that, but it is a closed cycle system. If it were to break and expose it would hopefully react very quickly and become an oxide, and become harmless. Chris - What would be the cost because one of the things that obviously drives this whole market and determines whether people will use this is what it costs? 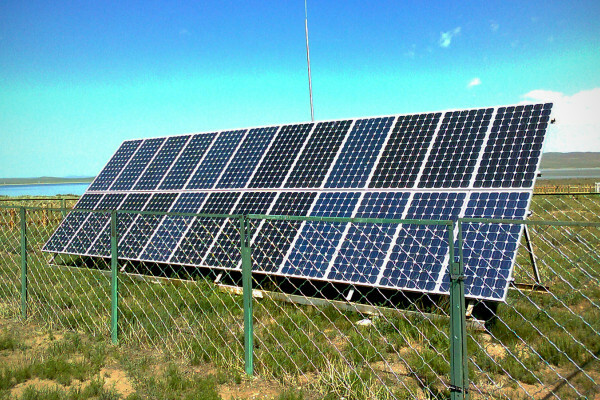 The present generation of photovoltaics are pretty pricey and they're pretty heavy. How does this device compare? Doug - I'm just not going to put a number on it. All I want to say is that this approach should last basically forever except for the expandable parts. Photovoltaics are lasting a lot longer than we thought. Let's say, 20 years or upwards of that and that's very good. So, this will last longer than that, but will be advantageous because of the 60% efficiency. So, whatever the final cost is, it will be amortised over that long lifetime and that improved efficiency. Chris - Is another advantage, not that photovoltaics also increasingly are making use of extremely rare and therefore, extremely costly materials which at the end of the day, we're not going to have as many of them or of them we use whereas if you're using something which is relatively simple like caesium, then actually, you're not going to face that same challenge? Doug - That's absolutely correct and that's a challenge with many high tech materials these days, be it thermoelectrics, photovoltaics or whatever. We have to start thinking about how we're going to use it, how we're going to recycle it, and how much that adds to the cost. It's a really very good point. Chris - And dare I ask you, when you think you'll surmount the various difficulties that you're currently trying to overcome? Doug - With sufficient funding, we're hoping to start hearing more about it. Let's say, hearing more about it in 3 to 5 years, but seeing it deployed as readily, I don't expect it to be before 5 to 10 years. How Massive can a Star be?